Webpack is a build tool for modern web applications. When Webpack bundles your application, it recursively builds a dependency graph that includes every module your application needs. From this graph it then packages all of those modules into one or more bundles. This concept of module bundling is not unique to Webpack, but its approach hashelpedit take the spot as the most popular build tool for bundling your application. Part of this is to due to the React community adopting Webpack pretty early on and creating more awareness around the idea of bundling Singe Page Apps into static assets. 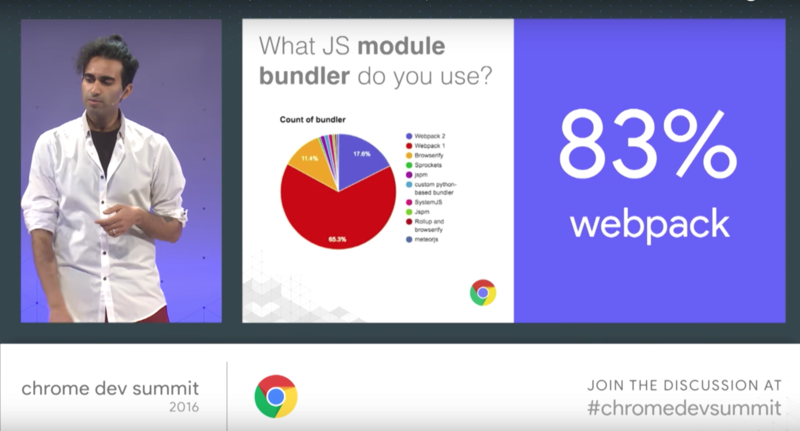 At the 2016 Chrome Dev Summit, Addy Osmani shared a remarkable revelation showing Webpack usage amongst devs who use a build tool to bundle their projects, Webpack owns 83% of that pie. I suppose you can say Webpack has the cake and eats it too. Webpack has found its way into a large of amount of boilerplates and CLI generated templates that provide little to no configuration and learning needed. Templates are great but there is a lot of value with understanding the underlying tools, which is why I am going walk you through how to get Webpack up and running in a React application by confidently using just the webpack-cli and nothing more. The follow tutorial will use npm to manage dependencies so please make sure you have it installed on your environment before you begin.Please be sure to confirm you are using npm 5 and node 8 or later. If node is not installed, you can find instructions on how to install node from the nodejs.org site. I recently made scones from scratch and it was a mind opening experience. In addition to all the steps it took, one included adding cold butter to flour with my bare hands and it felt wrong(mostly because I am new to baking), but at the end of that experience I had a tasty scone.I say this because the following might feel weird and I am going to ask you to trust me because at the end of this we are going to have a fully baked and production ready React application from scratch. Open up your terminal or equivalent command line prompt and create a folder called webpack-from-scratch move into that newly created directory. We can now install Webpack, remember you should be using npm 5 for this which saves references of dependencies (like Webpack) to you package-lock.json. Now that you have you project setup we need to focus on getting Webpack setup and doing what it needs to. From here on out, I am going to refer to running the Webpack CLI which just means type webpack in your terminal and press enter. Run the Webpack CLI and hitting enter. This should provide a helpful error message stating that we have no output webpack.config.jsfile. No configuration file found and no output filename configured via CLI option. A configuration file could be named 'webpack.config.js' in the current directory. Use --help to display the CLI options. Your config should now look like this. Webpack is built on four basic concepts, which I go into much greater detail in a previous post. These concepts include the Entry, Output, Loader, and Plugins and are all the available options for a webpack.config.js. Every thing you can possibly do falls within those concepts. Run the Webpack CLI and take note of the new error message. This error message is because we did not adding anything to an entry and out destination to yourwebpack.config.jsmodule. Output is necessary and will let Webpack know where to place the result from bundling. If you now run the Webpack CLI, you will see a new error stating that there is no entry set up. Configuration file found but no entry configured. Now add index.js to the Entry point of your Webpack module. If you now run the Webpack CLI, you should get an error and now have successfully bundled. So what happened? The answer is nothing yet, remember with great power comes, great responsibility. Webpack has created a bundle.js that looks exactly like you index.js, well sort of. What Webpack did was take all your modules making a dependency graph and place it in what looks like comments at the top of your bundle. I am not going to break that down now because that is reading for robots. However, if you if you look at the bottom of the file you can see our original console.log made it. /******/                 var getter = module && module.__esModule ? This is so amazing! You are now a Webpack expert, feel free to add me as a reference for your Senior Webpack Engineer applications. Despite you now being a Webpack expert, there are still more we can do with this module bundler. Having an entry and output for your bundle is only the beginning. Loaders are the concept of Webpack that does tedious things for you. We are going to add React to our project and in order use the latest React with JSX, we will need to add a babel-loader. Babel is a code transpilier that allows you to write code in the flavor you need and have it transpile to a version readable by non-supported browsers. Replace the below code in your index.js and run the Webpack CLI. Create a .babelrc file and add a reference to the babel-preset-env. Add new key to our webpack module, which will also have a rule that is our loader. There are few other popular loaders for converting SCSS to CSS and making CSS Modules available. You can also add loaders to import and convert different image types and files types, like SVG or TypeScript. There are certain problems develops need to solve over and over to get a production build. One of them is minification. Luckily Uglify is open sourced and available for us to use to make our bundle smaller. Add a new key to our webpack module, plugins, and include the UglifyJS webpack optimize plugin.You will also need to add the path module for the ability to provide path context to the webpack loader. Now run the webpack CLI, your bundle size should be significantly smaller. This is because all whitespace and comments have removed. All variables have been replaced with single characters, all for the sake of saving space. This is significantly harder to read for debugging purposes, which is why browsers have the ability to pretty print the contents from the web console. That does not account for the variable name changes, which can be tweak in the options for the plugin. You can also take advantage of this feature without adding the plugin by just adding the-pflag(production) to your webpack command line invocation. This will run UglifyJS without needing to include it and save the readability hassle when debugging locally. Run the webpack CLI with the mentioned -p flag and take note of your bundle.js size. We were able to shave off a 2kb’s just from minification. There are number of other plugins for webpack created by the community for Offline Caching, Compression, and Hot Module Replacement. Take a look at the list webpack recommendsin their documentation. React is a library that makes creating UI and the components much easier. We will need to add a few React dependencies before getting started. Add the babel-react-react to the .babelrc file. Create a new file, called index.html, trust me this is going to be great. Take note, that we re setting a script tag to point to our bundle.js. The body also includes a div tag with a root id. Update the index.js to use React code with the JSX code below. If you are not familiar with React I recommend checking out their getting started tutorial. Finally point the ReactDOM rendering to the root div and include the HelloWord component. Holy biscuits! We now have a React app. Thanks to webpack for doing most of the work and babel for getting on JSX on the page. If you open the index.html you be able to see el mundo glorioso. I assume you would like you want to share this experience with others and you can by deploying this amazing project to Netlify. There are a few things you need to do to make that happen. So far we have been using the webpack CLI to build. We also found out the the production flag is preferred. Add the the webpack command to your npm scripts so we can always run the production, even if we don’t think about it. We should now add the html-webpack-plugin to new index.html. Now remove the script tag from our index.html. Update the webpack.config.js to use the HtmlWebpackPlugin. I also am going make a change where instead of bundle in to the root ./bundle.js, I will now bundle into a build folder. With this addition, we can run a production build using npm run build, this is helpful when using the Netlify Continuous Deployment feature. Be sure to also set your build location as build. Webpack is a powerful tool that can do much more than just bundle your project. I hope you have a good foundation for understanding new and existing webpack configs. Check out the webpack documentation to find out how you add code splitting, compression, and adding a development server to your project. I go over that as well in a previous post on what build tools can do for you. Netlify comes with some handy, built-in features to process form submissions without having to write any server-side code. Learn how to integrate them in your React app. A CMS that is open-source but fully-featured and production-ready, that’s as easy to customize as it is to use, and that developers and content editors can build a community around.